As Hurricane Florence barrels towards the Southeastern United States, coastal communities prepare for imminent high winds and storm surge. However, climate scientists are most concerned about another risk – freshwater flooding. According to James Kossin, an atmospheric scientist for the National Oceanic and Atmospheric Administration, Hurricane Florence could cause extensive freshwater flooding. Florence is moving incredibly slow – on the order of just a few miles per hour. Once the storm makes landfall, it could stall completely like Hurricane Harvey did when it dumped more than 60 inches of rain on the Houston region last year. The catastrophic amount of rain shut down the region and resulted in nearly 100 deaths. Powerful, slow-moving storms are becoming more common according to a study published earlier this year by Kossin. Kossin found that tropical cyclones around the world have slowed down 10 percent in the past 70 years as climate change causes the wind currents that hurricanes ride to slow down. With global warming, storms are becoming bigger and more intense, explains Kevin Trenberth of the National Center for Atmospheric Research. 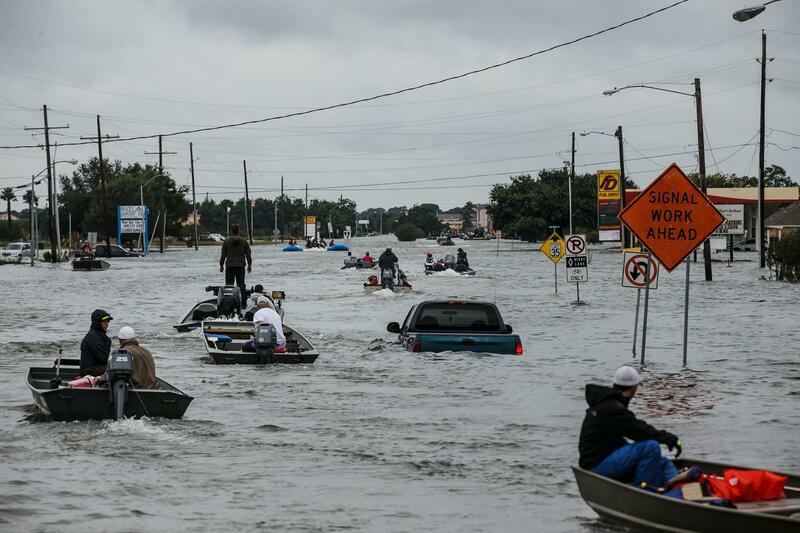 In a study published in May, he and his colleagues found rain from Hurricane Harvey was powered by the highest ocean temperatures ever recorded in the Gulf of Mexico. The greater ocean temperatures result in greater evaporation, which equals the amount of rain poured down when the storm makes landfall. Together, the increased size and slower moving storms like Hurricane Florence could spell potential flood disaster for communities in their path. For communities to become more resilient towards storms of this magnitude, its necessary to redesign our urban areas. As a previous resident of Houston, I have seen and experienced the damage caused by Hurricane Harvey first hand. Houston is an impervious city covered in roads, sidewalks, and parking lots. When rain hits these surfaces, it is unable to percolate into the soil as it does in the natural environment. Instead, rainfall runs off immediately into sewage drains, and dumps into nearby streams. In Houston, the streams are also concrete in an effort to prevent erosion; this completely alters the water cycle in a naturally swamp area. 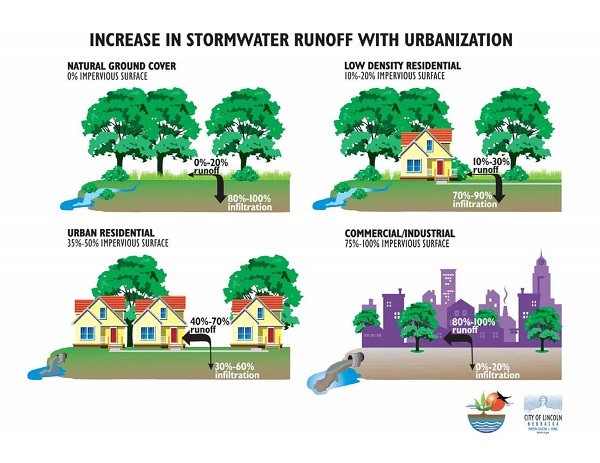 For cities to become more resilient towards these storms, we have to reduce the amount of impervious surfaces and mimic the natural ground cover as shown in the below figure.